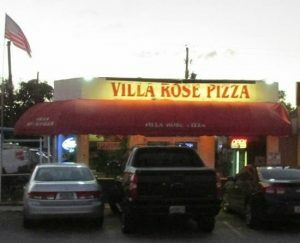 ***** Villa Rose Pizza, 1114 State Road 7, Hollywood, Florida 33021, (954) 983-7660. Last night- Jeff Eats, Mrs. Jeff Eats, Daughter Jeff Eats and Son Jeff Eats ate dinner at Villa Rose Pizza in Hollywood and we all agreed that the joint’s pizza, garlic rolls, garlic bread and other stuff were so delicious- that Jeff Eats- once again had to tell you guys that Villa Rose Pizza is an absolute homerun must try joint! If you want to eat some of the most delicious thin/crisp/sweet sauce pizza that you have ever had- then you gotta eat at Villa Rose Pizza in Hollywood. Trust Jeff Eats here, the pizza is absolutely off the chart! The joint has been around since 1957-and give or take a flat screen tv- the décor is the original ’57 furniture. Just in case you got a non-pizza eater in the car, Villa Rose has- a load of other real good Italian stuff- so everybody is gonna find what to eat. 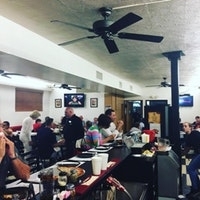 For years, Jeff Eats has been hearing some terrific things about Villa Rose Pizza (its been around since 1957) and the fabulous pizza that it makes—yet in all those years, I never got over there to try its pizza or food. Like I just said, can’t explain this! Anyway, last night Jeff Eats and Mrs. Jeff Eats were doing a “takeout” from Spadini’s Pizzeria in Boca Raton and while waiting for our order, we-got to talking with a lovely couple with two young children…blah blah blah and business cards were exchanged. Later that evening, Jeff Eats received the “below” e-mail from Chris Florea who we had spoken with earlier that evening. As you’ll read, he is a HUGE fan of Villa Rose Pizza. Chris has now got Jeff Eats’ juices pumping…and I plan to get down to Villa Rose sometime in the next 30-days. 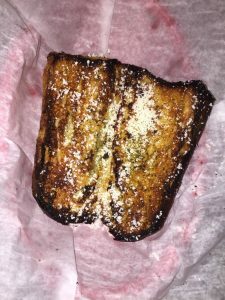 If you have been to Villa Rose, drop me a note on the joint…if you haven’t, Jeff Eats’ “gut call” says Villa Rose is a must-try. You can check www.villarosepizza.com for menu/prices/other stuff. 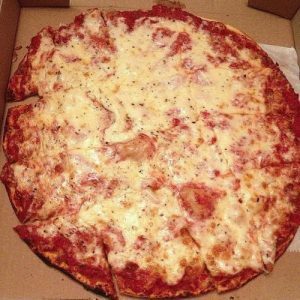 Villa Rose Pizza is open Sunday-Thursday 11:30am-10pm, Friday-Saturday 11:30am-11pm. Last night, Jeff Eats and Mrs. Jeff Eats “finally” made it down to Villa Rose Pizza and suffice it to say–the pizza was spectacular…thin crust, dynamite cheese with a sweet sauce. 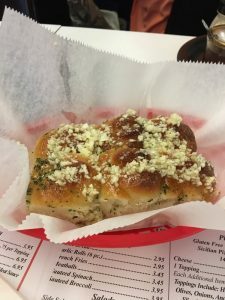 In addition to the pizza we also ordered Greek salad, -veal parmigiana sub, penne ala vodka–and I gotta tell you like the pizza, delicious–not “spectacular” delicious but neighborhood “mom & pop” red sauce-delicious. Villa Rose Pizza is a homerun…can’t believe I didn’t get to it sooner! menu because the pizza is all I ever eat there. You HAVE to try this pie!!! 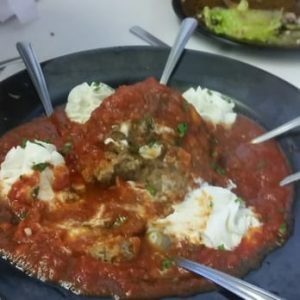 Ive been eating at Villa Rose for over 25 years. Some of the best thin crust pizza Ive ever eaten. This joint’s decor is a throwback to the 50’s & 60’s and is so cool. Try Villa Rose, you won’t be disappointed. Villa Rose is a great joint. My wife and I sometimes stop here before heading over to the Hard Rock casino to make a donation. Everything we have tried has been good. I enjoy the mozzarella sticks. Prices are reasonable as well. Some of the best thin crust Chicago pizza you ever ate. Pizza is off the chain delicious. Lasagna, chicken parm, ribs, pizza, pasta side, minestrone soup, garlic rolls, soda. Tons of delicious food .